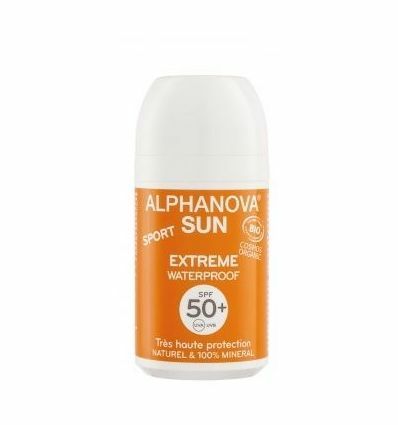 Roll-On Solaire SPF 50+ de Alphanova SUN au parfum Monoï, protection immédiate, Waterproof. Roll-On Solaire SPF 50+0 de Alphanova SUN à la formule enrichie en Aloé Vera , en huile de Jojoba et de Tamanu. Aqua, Dicaprylyl Carbonate, Titanium Dioxide, Caprylic/Capric Triglyceride, Glycerin, Simmondsia Chinensis Seed Oil*, Polyglyceryl-3 Diisostearate, Coconut Alkanes, Polyglyceryl-2 Dipolyhydroxystearate, Polyhydroxystearic Acid, Stearic Acid, Calophyllum Inophyllum Seed Oil*, Magnesium Sulfate, Sodium Chloride, Xanthan Gum, Aluminum Hydroxide, Parfum, Sodium Levulinate, Glyceryl Caprylate, Alumina, Coco-Caprylate/Caprate, Sodium Anisate, Aloe Barbadensis Leaf Juice Powder*, Linalool, Limonene, Citric Acid, Benzyl Benzoate, Tocopherol, Benzyl Salicylate.